On Saturday I finally did something I have always wanted to do: pick grapes for wine! 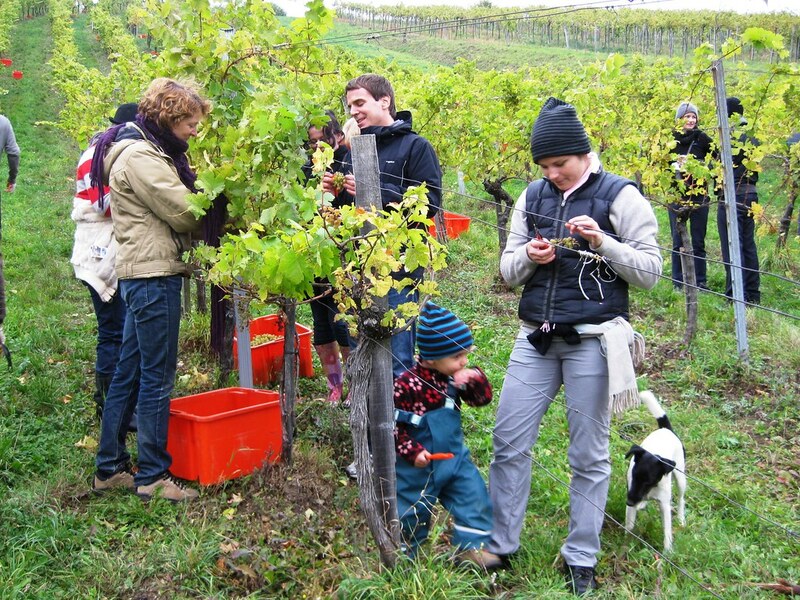 It started with an e-mail from Slow Foods Vienna asking for volunteers to help winemaker Jutta Ambrositsch harvest her “Sommeregg” vineyard (one of several she has) for Gemischter Satz wine. Vienna produces the most wine of any city in the world; the main reason is that the city has a huge land area and over 50% is open space (forest, hills and agriculture). Many of the hills surrounding Vienna produce excellent wine. The city even owns a winery called Cobenzl. Cobenzl has a wonderful view overlooking the city, a restaurant and an adjoining mini farm for children. A big plus for public transport fans in Vienna is that you can take the city bus to the vineyards! The 38-A bus (direction Kahlenberg) takes you from the U-Bahn (U4) terminal station Heiligenstadt to Cobenzl and on to Kahlenberg (another great view with a nice hotel and restaurant). On the way the bus goes through the Grinzing neighbourhood where there are many Heurigen (local wine restaurants). Anyway, back to the picking. Unfortunately Saturday was grey and cool – but at least it did not rain! – so I dressed warmly. After a brief description of what grapes to harvest (no mouldy grapes, no dried out grapes, no grapes damaged by hail or wasps – when the skin of the grape is open it gives a chance for vinegar bacteria to get in – and, very important, no lady bugs – they make the wine stink) we were on our way up the hill with our collection bins. 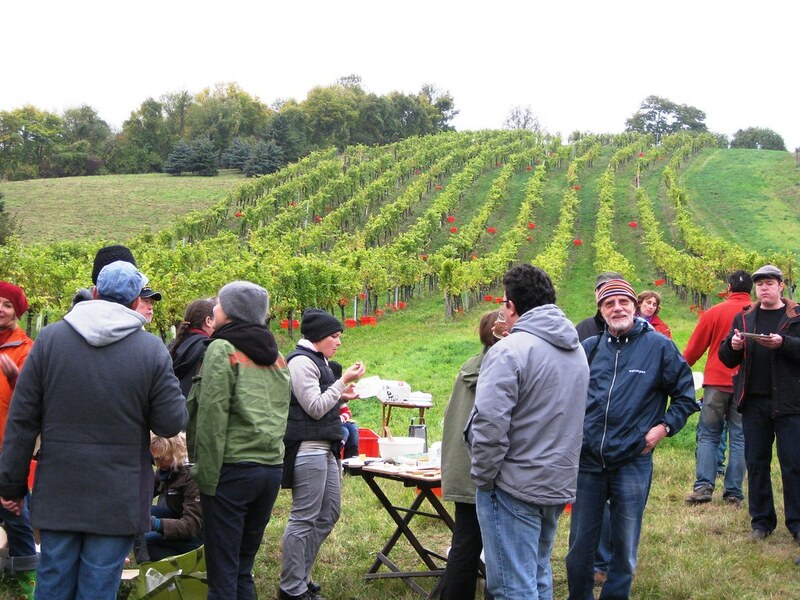 There were about 30 people helping harvest about a half-hectare area of grapes. The volunteers consisted of friends of Jutta’s and Slow Food members. It was a fun group with lots of talking during the work. I was lucky enough to work with someone studying agriculture and wine making, so I learned a lot and could always ask her if the particular grapes were OK or not before throwing them in the bin. Many hands make light work and we finished the field by about 3 pm (and even had time for a one-hour lunch break). Lunch was cold salads, cheese, bread, ham and some of Jutta’s 2007 Gemischter Satz (from the same vineyard we were picking) and a 2008 Riesling which was really excellent. 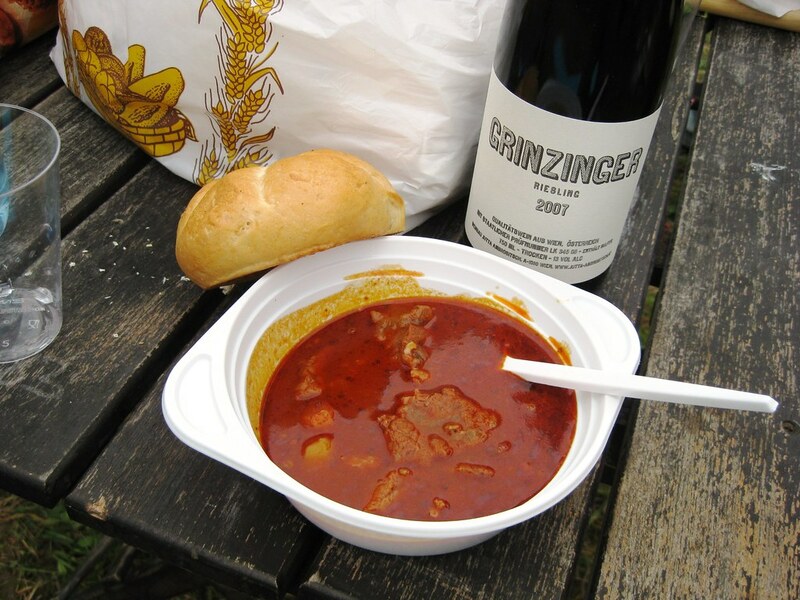 When we were finished we had a piping hot goulash soup – nice since when standing around (as opposed to picking) you became quite cold quickly. 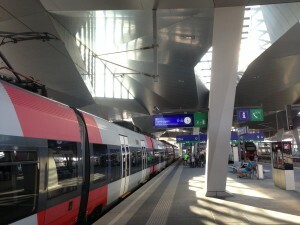 A little more wine and then back to the bus stop in Grinzing for the trip home. You may be asking yourself what is “Gemischter Satz”? Translated literally it means “mixed batch”. It is typical to Vienna and is made from vineyards that have many different grape varieties planted together. 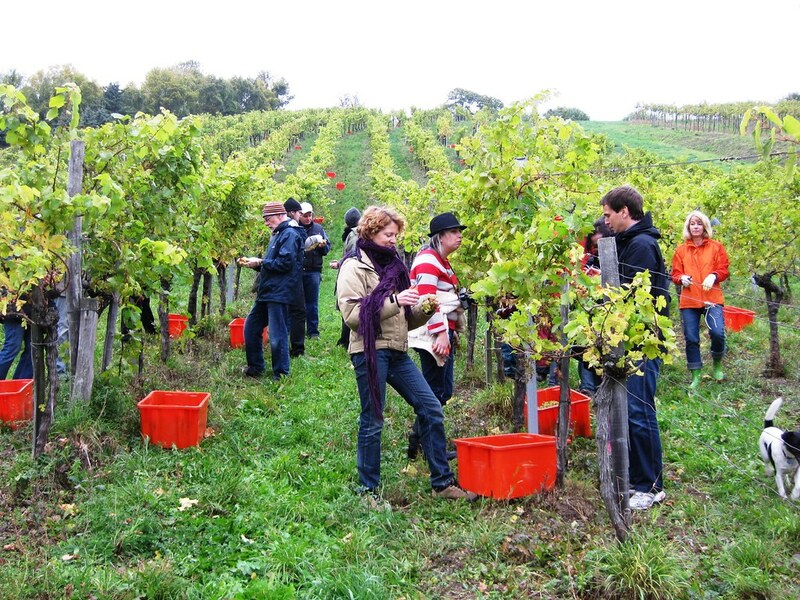 In Jutta’s half-hectare Sonnenegg vinyard there are about 20 different sorts of grapes including Grüner Veltliner, Weißburgunder, Neuburger, Riesling, Müller-Thurgau, Gelber traminer, Gewürztraminer, Zierfandler, Rotgipfler, Roter Veltliner, … and several traditional Austrian grapes that are unique). The Sonnenegg vineyard was planted in 1955 but has probably been used for grapes for centuries. Later this week we will attend the Slow Foods Terra Madre Austria congress at the Vienna City Hall. The congress highlights traditional foods from Austria and Gemischter Satz will be one of the foods that are officially recognised by Slow Foods at the event. We will go to a class on Gemischter Satz and learn lots more about it, so expect to hear more later. In the meantime, when you visit Vienna look for Gemischter Satz and give it a try – it’s not for everyone, but fun to experience. 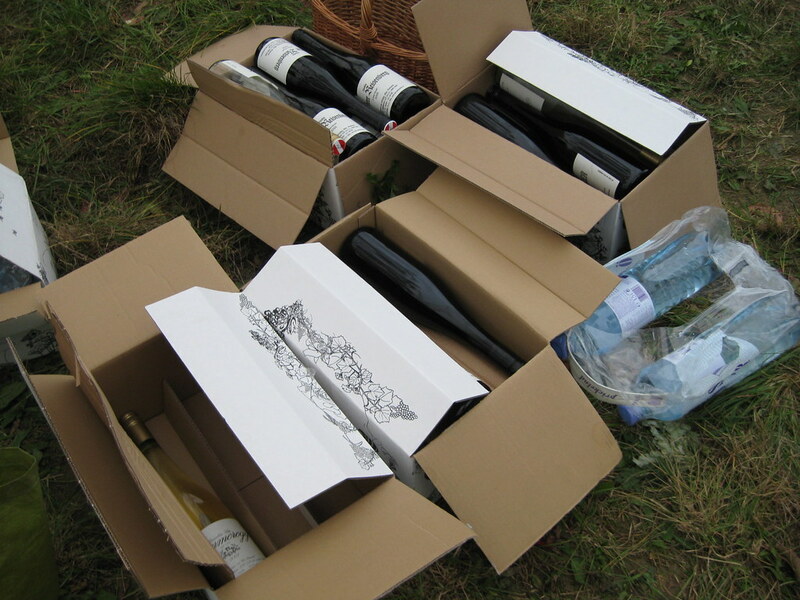 All photos from my flickr site, here’s a link to all the photos from picking Gemischter Satz at Sonnenegg 2009.